In many novels, the events of the story take place chronologically, in straightforward succession from scene to scene. However, in stories involving characters’ memories or large leaps in time, flashbacks are useful for showing formative or crucial moments that drive characters’ present-time psychologies and decisions. What is a flashback in literature? Flashbacks are scenes inserted into the present narrative time-frame from a time period that precedes the primary story arc. A flashback example: A female narrator in her 50s describes the day her younger sibling drowned on a family vacation. The example above strikes at something important about flashbacks: Flashbacks typically recall a scene of emotional power. They show the memories that haunt characters, although they can also be intensely happy moments. As an alternative to writing flashbacks, you can substitute exposition. Your central character can recall the day a traumatic or wonderful event happened. Yet describing the scene as though your character is living and experiencing it for the first time can be much more emotionally affecting. This allows the reader to see the pivotal story event with immediacy through your character’s eyes. What are the benefits of showing the reader the earlier scene through my character’s eyes? Is the scene important enough to my central story arc to break from narrative continuity? How will I convey to the reader that this is a flashback and not an event happening in the present time of the story? Provided your flashback contains important clues or explanations for your characters’ personalities and/or actions, it will not make your story less cohesive. Provided that readers understand your scene is a flashback (and not present-time narration), the flashback won’t create confusion. Writing flashbacks is storytelling time travel. Getting it right can be hard. So research novels that use this narrative device and see how other authors approach flashbacks. From the outset, this flashback creates the impression of a character who is observant and self-aware. It also establishes one of the central themes of The Great Gatsby: How people react to their privilege or disadvantages. This example is just a snippet of flashback. There are longer examples, too. For example, in J.K. Rowling’s Harry Potter and the Goblet of Fire, there is a scene in which Harry uses a memory-storing magical device called a ‘pensieve’ to view a court hearing that took place many years before. The hearing is crucial to understanding present narrative events. Although the scene is not Harry’s own memory, it functions the same as a regular story flashback. When you write a flashback, it’s important to choose a reasonable time-frame for the scene. Typically, a flashback will consist of a single conversation or event that occurs over a single day. There’s nothing to say you can’t insert an entire week’s events in the middle of your story. Keeping the time frame of your flashback brief, however, will ensure the reader isn’t too distracted from the present arc of your story. If you want to convey how an entire year in your character’s life was formative, for example, it is better to summarize this year in a few lines of expository narrative. Times change. Because time isn’t static, remember to show how your characters and their circumstances are different during your flashback scene. For example, if a character living in 1999 recalls the 1960s, think about how slang, music and other cultural details differ. 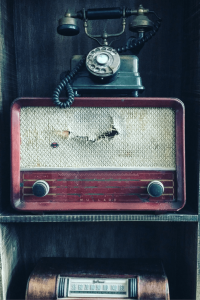 A few small details (such as a song playing on the radio or a description of a period hairstyle) can signal that we’ve traveled back in narrative time. List the most significant differences between your character’s present life and their life during the time period of their flashback. Even if not all details make it into the story, it will help you strike an authentic note. Whatever approach you choose, be consistent throughout your flashback scene. Pick a tense and stick with it. Part of writing a successful flashback scene is knowing how and when to cut to the scene that lies outside of your story’s main chronology. Like all story scenes, your flashback scene should have good structure (NB: You can download our free, concise eBook guide to crafting effective scene structure here). 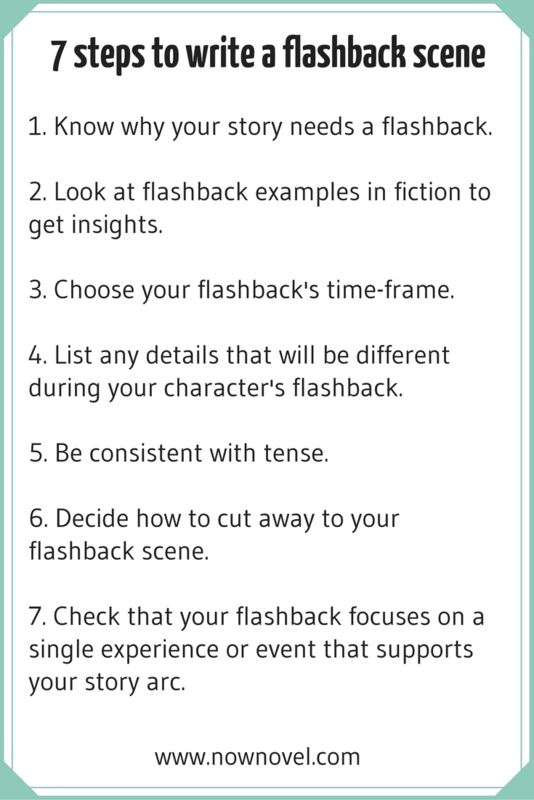 Instead of writing a short intro paragraph to a flashback, launch straight into your flashback at the start of a scene or chapter. This way the transition is less obvious – you can signal a change in time simply in narration, as in the example using reference to the year in section 5 above. Once you’ve written your flashback scene, double-check that it is completely relevant to the later story. In a murder mystery novel, a flashback scene might provide an essential clue regarding the identity of the killer. In a character-driven family saga, it could show a formative familial relationship, conversation or confrontation that shapes your character’s outlook. 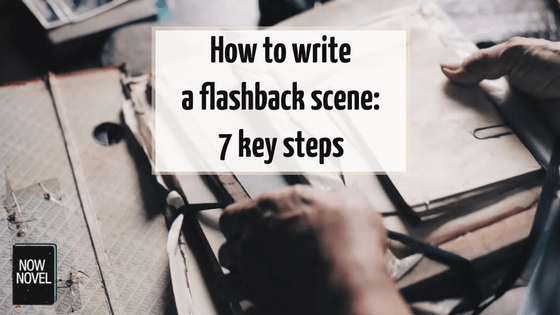 Make sure that your flashback scene draws your reader’s attention towards the key element that will deepen your reader’s understanding of key later scenes. This way, your story will feel cohesive even if the narrative does not follow a linear chronological path. Do you want to improve your craft? 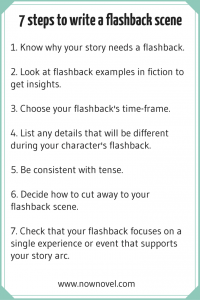 Start getting helpful feedback on your flashbacks and other scenes from other writers.